The "Maria S. Merian" was suspected of having infringed the Finnish territorial waters on March 10, 2017. The suspected violation occurred around midnight in the Åland sea. The case was in fact no drama, but it was quite a rare event. The Cpast Guard launched an investigation. The "Maria S. Merian" is docked at MWB Shipyard in Bremerhaven since 57 days for work on her Schottel drives after Berlin revealed she had cost €500,000 in repairs and lost 588 days work since she entered service eight years ago. The ship has been bedevilled by pod defects since she was completed by Kroeger Werft on a Polish hull in 2006 at a cost of €56.4 million. Installed was a main propulsion plant consisting of two Schottel electric propulsors Type SEP 2 of 2050kW with propeller diameters of 2,500mm developing 15 knots. A Schottel Pump-Jet Type SPJ 320 of 2,200kW max was also installed as auxiliary propulsion and the ship has a Schottel SST 900 steering system. The "Maria S Merian" docked at MWB in Bremerhaven on Aug 16, 2014, for the latest repairs after developing swivel bearing and other problems in her pod drives. The work, being carried out by German Dry Docks (GDD), has already lasted some three months and there was no word on how much longer she would remain out of operation. After questions were asked in Parliament about the repair-prone ship, the Ministry of Education and Research has revealed that the "Maria S. Merian" suffered 10 serious technical break-downs in her pod propulsion system prior to the latest repairs at GDD. Deficiencies in sealing, pod drive operation and swivel-bearing problems had been among the most prominent issues. According to the Ministry, the repairs had cost a total of about €500,000 and had meant yard stays of five to 189 days. The ship had been out of commission for a total of 588 days since commissioning in 2006, it added. Asked what the Government proposed to do about the situation, the Ministry said it was waiting for completion of a report on whether modifications should be made to the ship's propulsion system or to her maintenance and overhaul schedules. Findings will also be significant for the selection of drive systems chosen for future research ships, the Ministry said. The temporary repairs of the "Maria S. Merian“ in the port of nach Limassol after its collision with the Cyprus-flagged roro ferry "Pontos“, 20344 gt (IMO: 7718450), on Feb 28, 2010, will be completed by Mar 11. 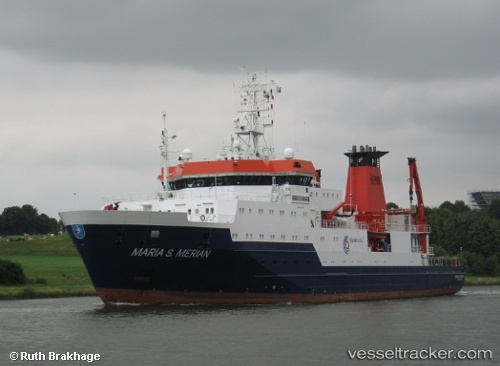 It will then start the research expedition „MSM14/3“ in connection with the CyprusArc-Project off the Cyprus coast which had to be postponed due to the collision. The involved scientists were accommodated in local hotels in the meantime. The damaged lifeboat has been replaced by additional rafts as the lifeboat and its launcher will only be repaired in summer 2010 at a German yard. Also the hull and a work platform had been damaged when the "Pontos" ran into the stern of the vessel and also pushed it onto two harbour tugs.